Wattle and Daub is a traditional technique used predominantly for period properties in Suffolk and throughout East Anglia. Daub is a composite building material usually used for coating a surface or, when mixed with straw and applied to wattles or laths, to form a wall – hence the term Wattle and Daub. The Emmerson Critchley team has been especially trained to produce daub in-house, which ensures the quality of the daub is the best possible and also cuts out the additional cost of acquiring it from a third party – a saving that is passed on to clients. 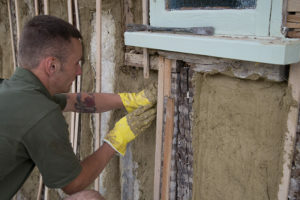 The technique of Wattle and Daub is one undertaken extensively by the Emmerson Critchley team, which has genuine passion for traditional techniques like this.